Oliver Hazard Perry Cabot finally got his wish to join the Navy of his illustrious ancestor Thursday, as he transferred a Don't Give Up the Ship flag to a modern frigate. 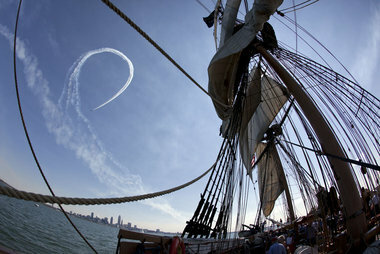 The ceremony, in Cleveland's inner harbor, paid homage to Commodore Perry's bold move in 1813 when he transferred command from the devastated brig Lawrence to the intact Niagara. Lightning flashed, hail fell and the wind roared as the mostly novice crew aboard a 26-foot boat pulled down the sails and motored for the Minnesota Point sand spit outside Duluth on Saturday evening. Although they were doing everything right under the circumstances, lightning took a deadly toll as the sailors scrambled through knee-deep water on the spit, trying to hustle everyone to safety, Sgt. Wade Rasch of the St. Louis County Sheriffâ€™s Office said Sunday. Like their 'bro's' and colleagues sailing in the J/29s a bit farther East on the Canadian seaboard, the J/27s managed to also attract a strong contingent of teams from across the eastern parts of North America to sail in the J/27 Lake Ontario's off Oakville (near Toronto). Here's the report from Dirk Sell, skipper of Willy-T. The Ensign National Championship Regatta continued Tuesday in Marquette. The U.S., Japan, Great Britain, and Canada are all competing in the races. And among them, is a group of high school and college girls, who are sailing with the best of them. Cup presented by Bayview Yacht Club. Editorial supplied by Candace Porter, Scowlines - There are few things in life where the effort ALWAYS fulfills the expectation. Winning an ILYA championship, race win, top 10 finish is consistently one of them. While the we may not be capable of capturing the emotional expressions of gratitude to those who supported them, know how genuine and heartfelt each comment was as the winners received their awards. With only four completed races, congratulations are in order for Tom Munroe Sr. on USA-11 â€” winner of the 2012 Melges 17 WMYA Regatta! Brian McMurray came second, some four points behind followed by Deb Gluek on USA-218 overall. After a relaxing day off where we got to watch some 49er racing, we came back to racing today with our final two races of the round robin. We wanted to come out and win both of them going into the quarterfinals and that's what we did, taking our score line to 8-3 overall and ranking us 4th. Gullisara claims the 2012 Melges 24 World Championship: one of the most coveted and prestigious titles in the sailing world was decided on the finish line of the final race when Carlo Fracassoli and his team had to wait an agonising four minutes for their nearest rival, Alberto Bolzan's Saetta, to cross the finish line before they could be certain of victory. Why canâ€™t sailing instructions just say what they mean and mean what they say? If the sailors know what the race committee means to say, but they havenâ€™t said what they mean, then what are the rules? What the RC means? Or what the Sailing Instructions say? Of course, it has to be what the Regattaâ€™s SIâ€™s say. But when the RC canâ€™t say what they mean, it frequently follows that is the SIâ€™s are confusing, incomplete, self-contradictory, or just nonsensical. I love sailing at night. Actually whenever I have to cover more then fiftysomewhat miles I prefer leaving late in the afternoon, relaxing the day before and arrive at daylight between next morning and noon. That way I get it all: Terrific Stars in the total black of some nights, romantic full moon and somehow it is even a challenging fun to count flashes and blinks on buoys and lighthouses to make the way through narrow fairways. Often this is even easyer at night than it is at daylight. Finally not to forget the next morning: Sunrise and breakfast at sea looks and tastes like an adventure of its own. Lake Michiganâ€™s waters will once again be reflecting the spectrum of the rainbow from all types of colorful sails and boats plowing through the waters of Little Traverse Bay, during Little Traverse Yacht Clubâ€™s (LTYC) 52nd annual Regatta, happening July 27-29.
â€œIt took a dip when the recession came, but numbers have come back up,â€� said LTYC Vice Commodore Kathryn Breighner.